This past weekend, I was thrilled to run across a beautiful old Magic Lantern in a flee market. With just a bit of haggling, I took it home. 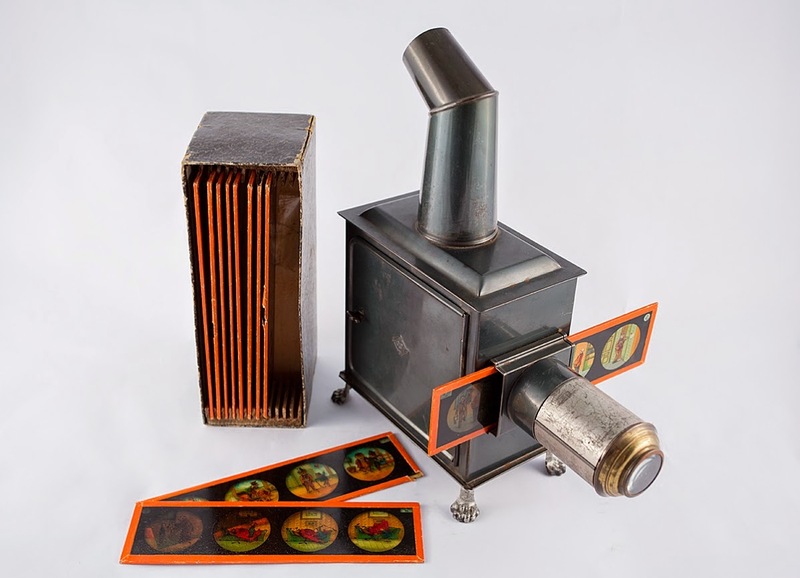 Magic Lanterns were used both to entertain and teach. 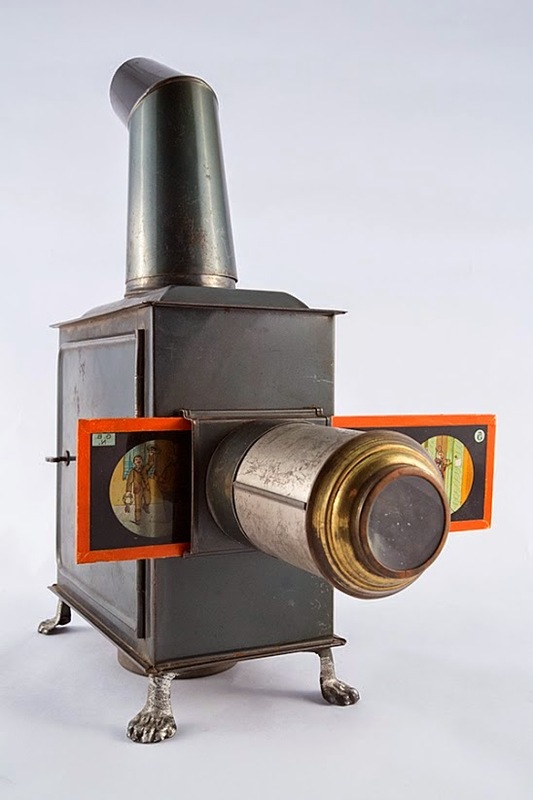 A magic lantern predates movies and slide. Essentially, it was a pre-electric version of a slide projector. 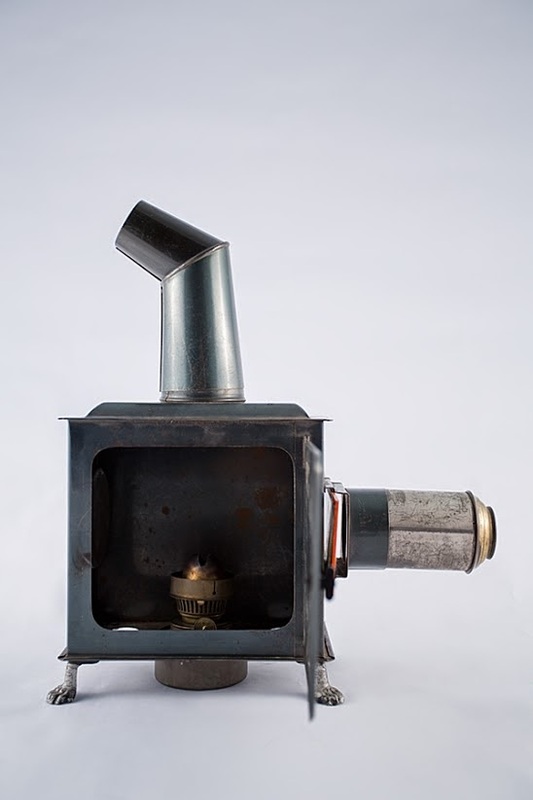 Mine is about ten inches tall, comes with the original box and slides, and has the little metal oil lantern that provided the light source. It appears to be a GBN toy magic lantern, similar to one that I found on the UK National Media Museum which cites a 1905 date. But mine has metal legs and a different sort of chimney. The toy ones are the ones for home use. 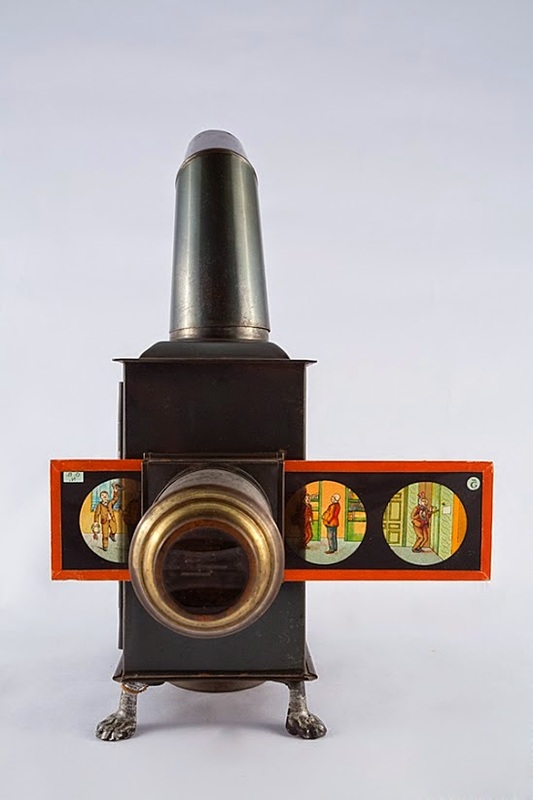 Wikipedia says: The magic lantern has a concave mirror in front of a light source that gathers light and projects it through a slide with an image scanned onto it. The light rays cross an aperture (which is an opening at the front of the apparatus), and hit a lens. The lens throws an enlarged picture of the original image from the slide onto a screen. Main light sources used during the time it was invented in the late 16th century were candles or oil lamps. These light sources were quite inefficient and produced weak projections. As I dug into this, I discovered online the Magic Lantern Society. They say; Introduced in the 1600's, the magic lantern was the earliest form of slide projector and has a long and fascinating history. The first magic lanterns were illuminated by candles, but as technology evolved they were lit by kerosene, limelight, carbon arc, and electric light. I emailed them and quickly got this response: The Encyclopedia of the Magic Lantern does not cite GBN, but the companies making toy lanterns were mostly in Nuremburg, Germany. You are fortunate to have the box and slides that fit as well as the lantern. Is there an illuminant? Toy lanterns were very popular for children in the late 19th and early 20th centuries. You see them in movies such as Fanny and Alexander. Magic lanterns were once a premium for a childrens' magazine in the early 20th century. They were used both to entertain but also to teach. Larger lanterns were used in schools, churches, Secret Societies, and as the machine that brought Illustrated Lectures of travel, science, history and religion to the citizens of towns all across the country, We estimate there were over 100,000 magic lantern showmen, ie, people, mostly but not all men, who gave lectures and shows using the magic lantern. If you go on ebay you will see the wide range of magic lantern slides still in circulation. If you are interested in the Magic Lantern and want to know more, the Magic Lantern Society has a quarterly research Journal that it publishes and a monthly enews letter of less scholarly news. We have a bi-annual convention. If you are on the West Coast, it is a great chance to meet other collectors and to mine their knowledge of yourlantern and other interests. We are an interesting group of people who collect lanterns, or slides or ephemera or whatever about the lantern and the culture around it. It was everywhere in the 19th and 20th centuries. UPDATE: In August of 2018, we finally tried lighting our magic lantern! And about a week after that, I noticed a Magic Lantern in the nursery of Mr. Banks' house (where Mary Poppins worked). Thanks to Stephen Herbert: "By the way, your little magic lantern marked GBN was made by the Bing Brothers, (Gebrüder Bing) in Nuremberg"
The phenakistiscope and 'stroboscopic disc' of the 1830s were the first instruments to create an illusion of movement based on rapidly changing sequence pictures; the basic technique used subsequently in one form or another by the zoetrope, the Zoopraxiscope, cinematography, television, video, and digital motion pictures. These intriguing spinning-disc toys and the sequence drawings produced for them have not been adequately investigated.